UPDATE: One-day passes to BTNW are now available for as low as $75. Educators, scientists, economists, peace activists, and futurists from around the world will join Barbara Marx Hubbard, former Vice Presidential nominee and matriarch of the New Age movement, to present lectures and workshops at the “Building the New World” conference. BTNW will focus on the reality that humanity – and all life on Earth – is threatened in multiple interconnected ways and that we must quickly implement rational and novel solutions to meet these unprecedented challenges. Hubbard’s “Wheel of Co-Creation” is the focus of the conference. The Wheel contains eleven interdependent sectors of society: (1) Education; (2) Communications; (3) Art; (4) Economics; (5) Peacebuilding; (6) Governance; (7) Health; (8) Environment; (9) Infrastructure; (10) Technology; and (11) Spirituality. BTNW organizers and over one hundred global co-sponsors contend that all these cultural categories need to be updated/upgraded in order for humanity to avoid a dystopian future. The conference features a diverse and accomplished line-up of speakers, including: The Millennium Project Director Jerome C. Glenn, Huffington Post columnist Valerie Tarico, Ph.D., economist and futurist Robin Hanson Ph.D., “Peace Musician” Yuval Ron, best-selling author Charles Eisenstein, Shift Network Director of Peace Philip Hellmich, Indigenous Grandmother Mona Polacca, Federation of Damanhur Ambassador Shama Viola, Integral Church founder Joran Oppelt and PROUT Yogi Dada Maheshvarananda. Dozens of intentional communities also are participating in the conference. 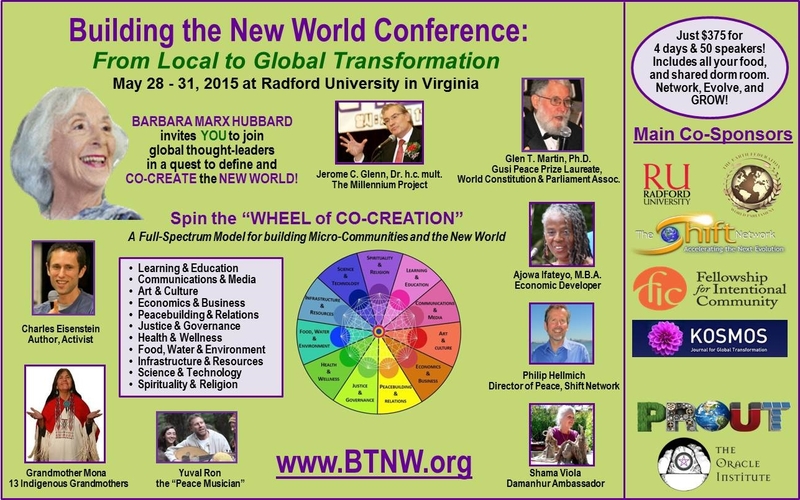 BTNW will take place at Radford University in Virginia from May 28 to May 31, 2015. Cost is $375.00 (students $250), which includes a 4-day conference badge, all meals, and dorm room on the Radford campus. For more information and registration: www.BTNW.org. This entry was posted on Monday, March 16th, 2015 at 9:48 pm	and tagged with Barbara Marx Hubbard, Building the New World, Conference, events, Radford University, Wheel of Co-Creation and posted in Events, Integral, Interfaith. You can follow any responses to this entry through the RSS 2.0 feed.